Join us for a keynote talk by Nikkita Oliver, a Seattle-based creative, community organizer, abolitionist, educator, and attorney. Working at the intersections of arts, law, education, and community organizing, she strives to create experiences which draw us closer to our humanity. Her work asks us to engage what we see happening now and to imagine what we hope to see in the future. She has opened for Cornel West and Chuck D of Public Enemy, featured on the Breakfast Club, performed on The Late Night Show with Stephen Colbert, and featured on The Breakfast Club and KUOW's The Week in Review. Her writing has been published in the South Seattle Emerald, Crosscut, the Establishment, Last Real Indians, The Seattle Weekly, and The Stranger. She organizes with No New Youth Jail and the Seattle Peoples Party. Oliver was the first political candidate of the Seattle Peoples Party running for mayor of Seattle in 2017. 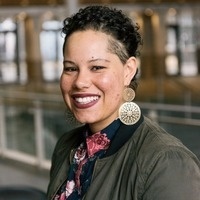 The Nikkita Oliver for Mayor campaign narrowly missed the general election by approximately 1,100 votes, coming in third of 21 candidates.